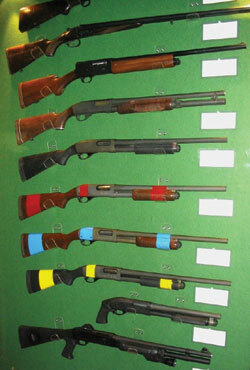 All police officers have to qualify in the use of firearms but few go on to specialise in this area. Those that do may be the finest shots in the country and generally work in the field of special tactics and operations, arguably one of the most dangerous yet exciting areas of policing. Their work necessitates not only the ability to shoot exceedingly well but also to do so in a range of weather conditions, locations, at short notice and from a cold rifle barrel. Australian Shooter explores the world of police marksmen. Friday July 3, 2004 was another beautiful sunny day in Sydney - unusually warm for a midwinter day, with little wind and a seemingly perfect weekend ahead. It was the kind of day you’d think there wasn’t a care in the world, and for most people, that was true. But for NSW Police Tactical Operations Unit, also known as the TOU - part of the State Protection Group - it was to be the beginning of a long day indeed. 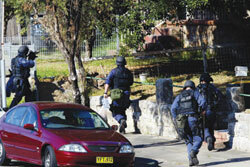 They would be called in to help end a siege in Banksia, a southern suburb in Australia’s biggest metropolis. The police arrived at the house about 10am, to execute a search warrant and make inquiries regarding the suspicious death the day before of the occupant’s girlfriend. However, 23-year-old Nathan Mazurani, who neighbours described as ‘quiet’ and ‘amicable’, greeted police with a hail of bullets, letting off about 12 random shots from his illegal handgun. Police retreated to a safe distance and called for support from the State Protection Group, who are properly trained to contain situations where an armed offender poses a threat. This siege would last 34 hours, during which the TOU stood ready to act while negotiators spent two days trying to diffuse the situation. However, Mazurani would not give himself up and broke off all contact with police negotiators on the Saturday afternoon, taking his own life later that day. 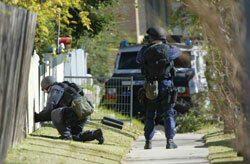 While sieges, such as this are relatively rare occurrences in Australia, each state and territory has their own police units specifically trained in this area, including the kind of extensive firearms training that can turn a reasonably good shot into a police marksman. Whatever name they go by, these teams are basically tactical operations police officers that resolve counter-terrorist and other high-risk situations, such as sieges where the offenders are armed with knives or rifles. When a situation is deemed a higher risk than uniformed police are equipped to deal with, in NSW, it’s the Tactical Operations Unit that’s called in. TOU personnel undertake a number of activities, including uniformed patrols in high crime locations. However, it is in the area of armed offender ‘containment’ that their skills in firearms may be called on. Though the term ‘police sniper’ implies strong similarities with military snipers, their agenda is very different, as McGilchrist explains. However, the only way a police marksman can shoot someone in an attempt to resolve the situation is if there’s an immediate threat to the lives of others, be they hostages, police officers, innocent bystanders or even the suspect himself. Clearly, for the police marksman, his main priority is to diffuse the situation, not to gain a good head count. It’s all about containing the problem. The use of a police marksman, particularly in the role of sniper, is always necessary when lives are at immediate risk. Very few people however, have ever been shot by police marksmen, even though these marksmen clearly have the skills and training to do just that, when there are absolutely no other options available. However, the work of the elite police marksman is seemingly shrouded in mystery, often to protect the individuals involved but also because it’s a difficult area of policing to discuss openly. “I think very little is known about police marksmen, even in general policing,” admits McGilchrist. “There are misconceptions out there, mostly based on what people have seen on TV and at the movies. People expect police marksmen to be able to shoot at anything, any time, like you see in Lethal Weapon, which no-one can actually do, not even national-grade shooters. “The reality of their job is very different. For the police marksmen, they experience very little action interspaced with long periods of training and boredom. There’s paperwork no matter where you go in the police service. Even with the ammunition they use, it has to be recorded. Every cartridge must be accounted for - it goes towards monitoring the barrel life of their firearms as well as determining maintenance schedules, like when to clean their firearms. Documenting the training is even more important, should a police marksman be involved in a fatal shooting. All the evidence of their training is then likely to be brought before the coroner, to ensure that the man involved had received the appropriate training, that he was proficient in the use of his firearm and that his performance was monitored appropriately. “Everything that police marksmen do is open to scrutiny that becomes even more intense whenever there’s a fatality,” says McGilchrist, admitting that while fatal shootings are exceedingly rare, the need to have all necessary documentation in order is of utmost importance at all times. In NSW, the police marksmen are required to train on at least a monthly basis, often more regularly than that, as well as travelling to New Zealand and Western Australia to train with other tactical police teams and to receive tuition from specialist military units. While training is the backbone of the TOU, it also helps to select personnel who have certain characteristics, which will serve them well in this line of work. “A steady nature in general is the main trait required,” says McGilchrist, adding, “You’ve got to be patient, fairly precise and have a certain level of calmness. To be good at shooting, a lot of it is about being able to control your breathing and just being relaxed when you do it. “But, it’s also about staying calm when things around you are getting very hectic. Under stressful situations, like those facing police marksmen, you have to be able to calm yourself down and concentrate on what you need to do with your shooting - to make sure your shot is well-placed. It’s almost like having the ability to meditate without meditating but still staying alert. “That’s the main characteristic we look for in good marksmen because you can train anyone to shoot well. We need people who can shoot well in the situations they’re likely to be placed in, who can keep a calm head and be consistent in their shooting. Good eyesight is also important, obviously, and being prepared to undertake the level of training that will ensure they can shoot well. But, they have to be interested in the line of work to begin with, because all police marksmen are volunteers, no one gets seconded into that section of the police service. In NSW, police marksmen use a Remington 700 platform in 7.62 calibre (.308 Winchester) with actions that are between 20 and 30 years old - but have recently undergone a rebuild. Every three-to-five years barrels are examined using specific gauging and instruments, and the actions are rebuilt. While the equipment always has to be up to scratch, the human factor cannot be underestimated. For example, it’s only when you compare the shooting accuracy of police marksmen to other police and even to Olympic rifle shooters that you get a real feel for what a specialist field it is. The average police officer has a level of marksmanship based purely on defensive shooting, which is also why they carry handguns rather than rifles, as handguns are considered a defensive weapon. An Olympic rifle shooter is trying to get the tightest group of shots together on his target and he’s in a very different operating scenario. All the stress Olympic shooters are under is self-induced because they’re competing. It is very different shooting in an operational environment. “Our guys have set criteria to meet in relation to their marksmanship,” says McGilchrist. “To become a police marksman and stay qualified in that field you must be able to consistently hit a target at 100 metres within a specified diameter - with your first cold shot. When they go to the range, there is a specific target that’s put out and the first shot from their rifle must fall within that criteria. Sadly, police marksmen have little opportunity to compare their level of skill with others. They tend not to enter shooting competitions or even discuss their shooting with outsiders. Some participate in sport shooting activities, like the competition shooting events held at the Australian and New Zealand Police and Emergency Services Games but not in an official capacity and not as part of their normal police training. There are few times in life when it’s enough to just know you’re the best, without public accolades or the opportunity to rank yourself against others of similar skill. But perhaps one of those times is at the end of a 34-hour siege when, as one of the police marksman on duty, you can walk away knowing you’ve saved lives - at least for that day.